Denver Broncos quarterback Peyton Manning considers a question after a Jan. 7 practice in Englewood, Colo.
Peyton Manning had another bad postseason, losing 24-13 to the Indianapolis Colts on Sunday and going “one and done” for a record ninth time among quarterbacks. The mystery of his seeming underperformance in the playoffs remains, but I’ll leave that for another article. 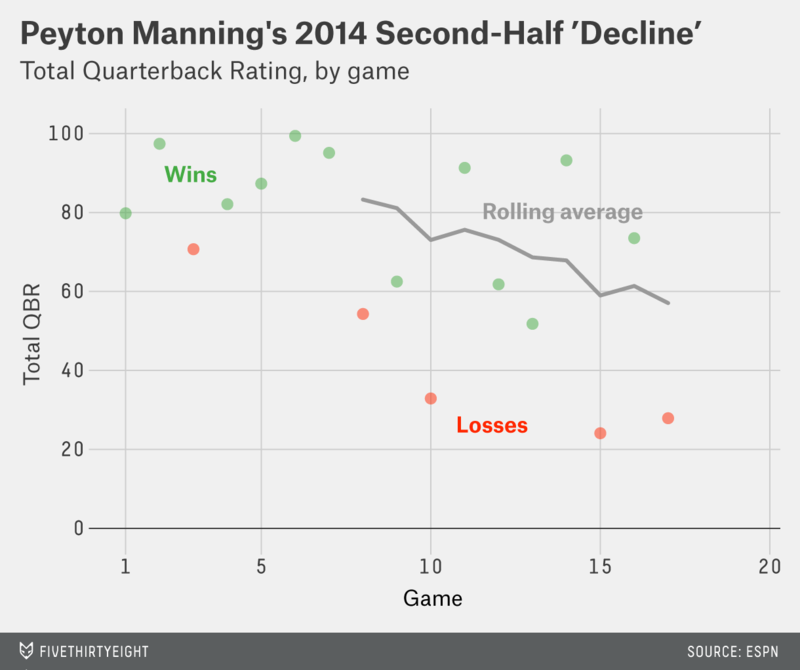 For now, let’s focus on a more pressing question: Is Manning finished? Manning looked like late-90s Marino today. That was tough to watch. Had fun rooting against him all those years. At least I still have Eli. As a late-1990s fan of the Miami Dolphins, I’m offended — Simmons mocks my pain. With Dan Marino putting up some of the worst statistics of his career, the Dolphins won as many as 10 games only once in his final five years. 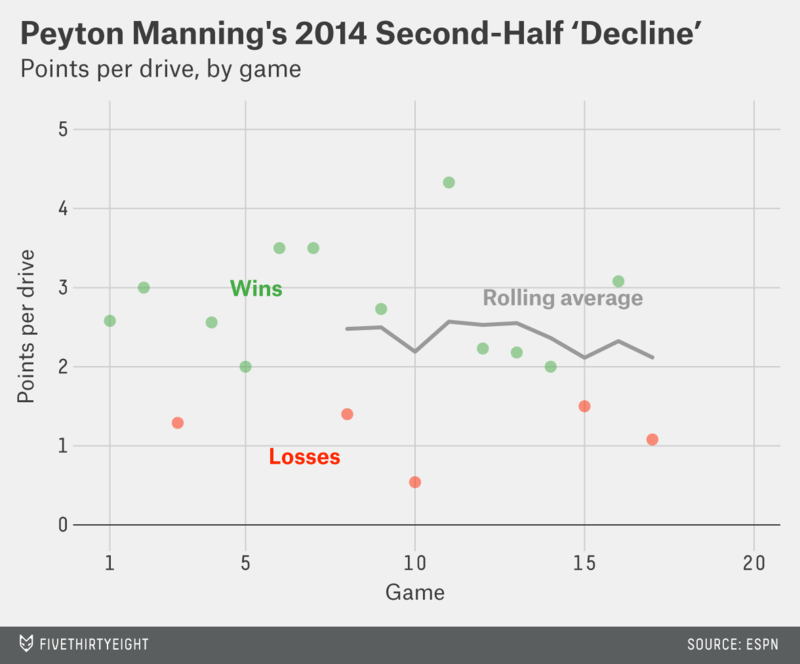 Manning has won as few as 10 games only once in more than a decade. Granted, in Denver’s 24-13 loss to Indianapolis last weekend, Manning had an epically bad day, throwing for only 211 yards on 46 passes. His 4.6 yards per attempt were the second fewest in a postseason game of his career. And this put an exclamation point on what many perceived as a late-season decline, which has led to much speculation as to what happened — some charitable (Manning was playing while injured! ), some less so (Manning’s arm strength has regressed!). As far as passing stats go, the perceived decline looks legitimate. At midseason, Manning looked like a possible MVP, with 24 touchdowns and only five interceptions through eight games. But since then, he had looked more average, with 15 TDs and 10 interceptions in the second half of the season. His eight-game rolling average has dropped by more than 20 points. Terrible, right? Manning must be too old to handle the grueling NFL season! But there’s a problem with that: Before the playoff debacle, the Broncos went 6-2 in the second half of the season; that’s the same record they had in the first half. “Wins” are a much-maligned stat in sports analytics, largely because they can fail to capture a lot of what goes on in a game: A QB can play terribly and be rescued by his team’s defense, or a team can just get lucky. But other stats have their blind spots as well. For example, passing stats, no matter how advanced, will generally always miss the potentially considerable effect that a quarterback can have on other aspects of his team’s offense. In the first half of the season, Denver was fifth in the league in points scored per drive (with 2.38 points per drive). In the second half, Denver was fifth in the league in points scored per drive (with a slightly smaller 2.25 points per drive). 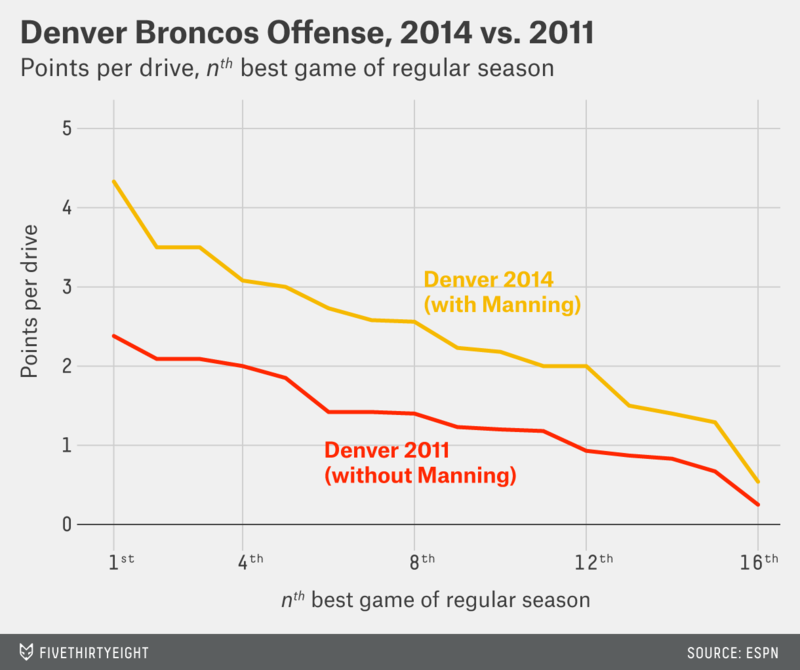 People noticed that Denver could still move the ball despite Manning’s declining stats, but they tended to attribute that to the running game. The Broncos gained nearly 130 yards per game and 4.4 yards per rushing attempt in the second half vs. 95 yards per game and 3.7 yards per attempt in the first. But I think this argument — that the running game compensated for Manning — is actually a pretty good example of how narratives based on short-term statistical fluctuations can be off-base. Whether and how much credit a QB should get for his team’s running game can be difficult to determine because we don’t know who’s responsible for what. We’re generally willing to give Adrian Peterson credit for Minnesota’s running game, but much more difficult cases abound: Mike Shanahan’s Denver squads had six different thousand-yard rushers in nine years (between 1998 and 2006). But here we have a 6-2 team maintaining a similar offensive efficiency, leading to a similar 6-2 record, despite a decrease in its quarterback’s QBR. Is it plausible that this known quantity at quarterback suddenly got a lot worse while his running game suddenly got a lot better? If the two were independent, maybe. But they’re not. Both offenses and defenses can divert resources to focus on one thing or another, and the results don’t always show up in the stats the same way. For example, defenses may key in on the passing game, thus hurting a quarterback’s stats but opening up the running game. Punishing a QB for letting running backs do the heavy-lifting is as silly as criticizing a point guard like Chris Paul for getting a bunch of assists instead of a bunch of points. Or sometimes it’s just dumb luck: You try a few short-yardage runs and a few short-yardage passes — even if they’re equally effective, sometimes you’ll just run better one way than the other. Peyton Manning is still an amazing quarterback.